Frisby looks at the wages paid in ancient Athens (450BC), because it tells us a lot about the silver price today. The Athenian talent, about 26 kg of silver, could purchase nine years of a skilled man’s labour. If we assume 250 working days in a year, that works out to about 11.5 grams of silver per day, or a little under 0.3 of a troy ounce. A kilo of silver today is about £460, so nine years’ skilled labour would be about £12,000 in today’s money. That makes a year’s skilled labour about £1,333, and a day’s £5.29. Today, the average wage in the UK construction industry is about £30,000 per annum, or £120 per day. Today’s British labourer is earning considerably more than his ancient Athenian counterpart. The Babylonian worker might have earned 2 grams of silver (92p). The Roman unskilled worker, like the Greek, might have earned 4.2 grams of silver, at least until Romans started chipping their coins. The wages of the medieval English worker had fallen back towards Babylonian levels by 1300. He got 2.8 grams, while a skilled city craftsman might have expected 5.6 grams, about half what an Athenian was paid. By the 19th century, the skilled labourer might be looking at around 24 grams of silver per day. The 19th century labourer was getting about double the pay of his 450BC Athenian counterpart. Compare that to today. Frisby used £30,000, the average wage of a construction worker, or £120 per day. That amounts to 260 grams of silver, compared to 11.5 grams for the Athenian worker. Today’s pay dwarfs that of any pre-20th century worker in history. Wages have risen, but not by this much relative to the cost of living, status and so on within a society. It’s not that wages have soared; it’s that silver, having no monetary role, has become cheap, historically and geologically. If today’s wages of £120 were to equal the Athenian equivalent of 12 grams, silver should be £10 per gram. 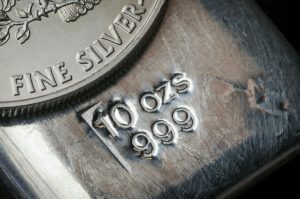 That’s over 20 times higher than today’s silver price of $18.50 an ounce—more like $400 per ounce. At $400 per ounce, not only do wages correspond, so does the cost of constructing ships or city buildings. One day we will see silver reverting to its historical mean, and we should all prepare. “One day we will see silver reverting to its historical mean, and we should all prepare.” This may be sooner than you think, – (clue) go and read ‘Second Chance’ by David Smith and David Morgan!